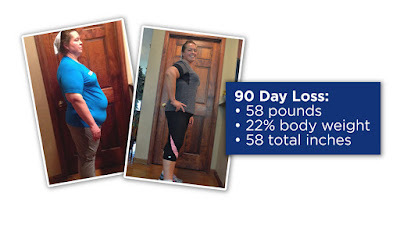 Amazing men and women participated in the SLMsmart 90-day Challenge beginning February 2015. Participants all over the United States dedicated themselves to take big strides toward healthy living. Synergy WorldWide was honored to provide each participant with the necessary tools for healthy, maintainable weight management. The Challenge results were life-altering, and the challenge participants' success with SLMsmart will motivate many around the world to tackle their weight management goals. "When I heard about Synergy's 90-day Challenge, a desire to take control of my life was ignited. I set out on a journey determined to reach my goal of actually becoming fit—to build muscle and see a transformation instead of just being less fat. It wasn't always easy, but I strictly followed every workout provided by the 90-day Challenge and incorporated Synergy's life-changing products every day. The SLMsmart Shake, ProArgi-9+, e9 and Body Cleanse became staples during these three months. Aside from the number on the scale, I saw a transformation in my physique. I finally saw muscle I never thought I had! And most importantly, I feel good in my skin. I have my confidence and energy back, and I feel like a new person inside and out. My life has turned 180 degrees and I couldn't be more grateful to Synergy for providing the medium to get me to where I am today. This is the first step in not only changing my life, but hopefully helping many others do the same." CLICK HERE to read Eva's SLMsmart story.